Wangaratta murder suicide leaves four children orphaned. Husband and wife killed in Wangaratta 'murder-suicide' had four children. 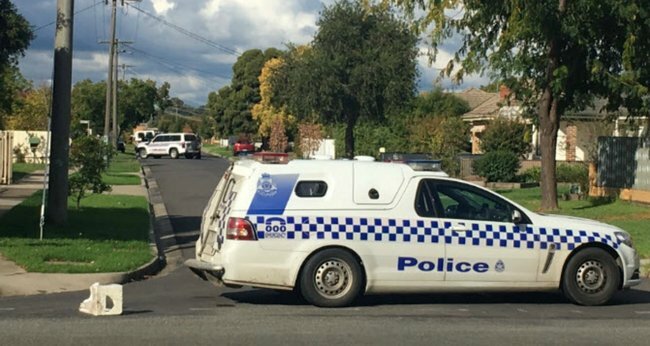 The apparent murder-suicide of a “well-respected” husband and wife in the Victorian town of Wangaratta has sent shock waves through the local community. Wangaratta mayor Ken Clarke says the city will come together to support the families of the deceased couple as well as their neighbours, in whose home the tragedy unfolded. A 43-year-old man and a 39-year-old woman were found dead in a Belle Avenue home about 5.10pm on Tuesday after a stand-off with police. According to Fairfax Media, a witness told police they had earlier seen a man with a rifle and telescopic sight chasing a woman. The pair are said to have entered their neighbour’s house, with two adults and six children leaving unharmed shortly after the firearm was discharged. Mr Clarke says four of the children belonged to the couple, and two to the neighbours. “We’re very concerned about the whole situation. Both families were well known in the community and the schoolchildren involved, and we’re quite devastated with what’s happened. It’s going to be quite an exercise for people to get back on track after this,” he told AAP. “To the best of my knowledge they were a well-respected and well thought of husband and wife, so we’ve got no idea what happened to cause him to do this. Kris Clarke, a bartender at the nearby West Side Tavern, said some of the couple’s family and friends were in the tavern as the tragedy took place. “A few of their close family and friends were in here when it happened. They just broke down straightaway,” he said. Nearby St Michael’s Anglican Church first counsellor Luigi Bonacci said the deaths will have a big impact on the “tight-knit” neighbourhood. “It will be a sad time for everybody and people will be wary about what’s happened because where we are is a very tight-knit area, there are a lot of families and young kids,” he said on Tuesday. The deaths will be the subject of a coronial inquiry.